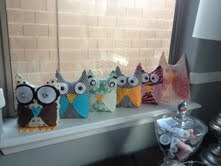 We had a hoot of a time! 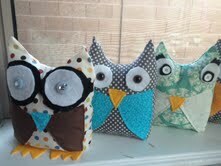 My kids and I made these adorable owls. Even Mark, 4 yrs & Sophia 6 yrs got in on the fun. 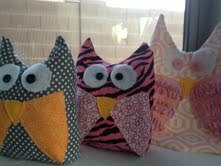 I ran out of stuffing so my owl (in pink) did not get stuffed. I added ruffles to my wings and made mine a little bigger. I am the mama owl after all! I think everyone did a great job! We are all going to enter them into the Az State Fair. I can't wait to see who wins the 1st place ribbon!